the open-tank test (74 cm × 30 cm, 75 l). Red lines indicate outer areas (4.62 cm wide at the width, 1.88 cm wide at length), and green lines define 12 exploration areas (18.5 cm × 10 cm). Latency to emerge from start box (SB; 19 cm × 8 cm × 10 cm) was observed from slit made in black plastic on exterior tank. 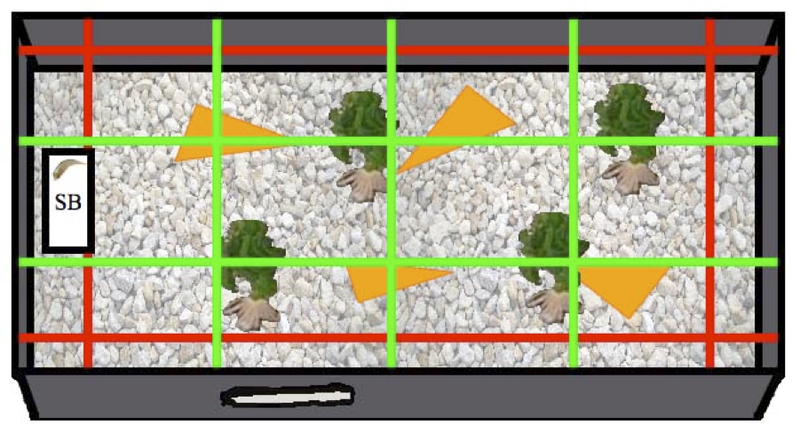 Four potshards (orange triangles) and four aquarium plants (digital replica of plant) were interchangeably dispersed in arena. Water depth was manually kept at 10 cm. the feed test tank (V cm × V cm, 10 l). Dark green line measures 3 cm from the bottom of the tank. Light green line measures 5 cm from the bottom of the tank. Water was kept manually at 10 cm, and 80% of food (red, orange, and yellow dots) remained at surface of water at beginning of feed test. Maternal Effect on Astatotilapia burtoni Cichlid Fish Anxiety-Mediated Behavior and "Personality"
Maternal care is a fundamental social experience in the early development of many animals. The level of maternal care an individual receives can impact later life behaviors, including anxiety-mediated behaviors. A wealth of literature links maternal effect to anxiety-mediated behavior in laboratory rat populations. The mechanism behind this link has been extensively studied. Less studied is the equivalence of anxiety-mediated and bold behaviors. While neurobiologists use the term anxiety-mediated behavior, personality psychologists and some behavioral ecologists use the term boldness. Boldness is a "personality" or behavioral syndrome. Boldness has been used as a measure for risk-taking behavior, fearfulness, emotionality, and anxiety. This last term (anxiety) relates to a broad set of anxiety-mediated behaviors. Most populations of animals can be classified on a shy-bold continuum. By studying a suite of correlated behaviors across situations, researchers can more strongly argue that a given behavior or effect is consistent in a population or species. By applying a comparative approach to address the evolution of anxiety-mediated behavior and obtain a biological understanding of the bold behavioral syndrome, the current study used cichlid fish raised with and without mothers in controlled laboratory environments. Rigorous behavioral observations in one exploratory and one feeding assay at two stages of development (juveniles and adults) were conducted to accomplish these aims. This study was the first to provide comparable data between anxiety-mediated behavior of fish and rats, and found that fish raised without mothers took longer to begin eating and fed for a shorter duration of time. Trends indicated that the same fish may also explore for a shorter duration of time. This evidence supports the claim that anxiety-mediated behavior influenced by maternal care is evolutionary conserved. Because fish and rat behavioral results resemble each other, this thesis has implications for the conservation of mechanism as well. Contradicting correlations between suites of bold behaviors provided evidence necessitating revisions to basic nomenclature in personality research. 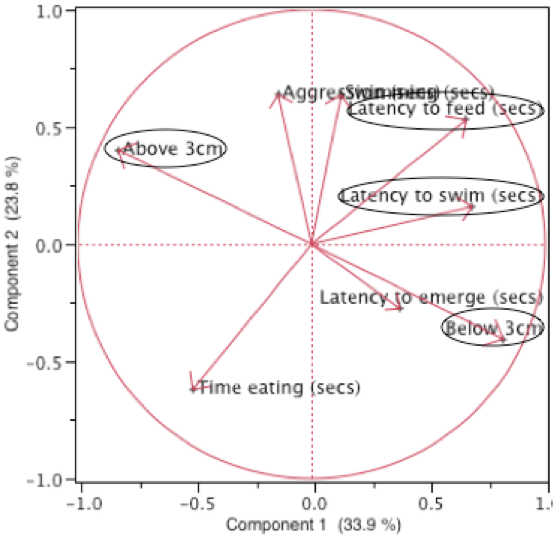 Most (33.9%) of the variation in boldness behavior was characterized by latency to swim, latency to feed, and vertical (below and above 3 cm) behavior. It is unsurprising that below and above 3 cm were inversely correlated with each other. By ethogram definition, when fish that spent more time above 3 cm, spent less time below 3 cm. But it is more interesting that the three remaining behaviors are positively correlated. In this respect, PC1 separates fish that are slower to begin eating and swimming from those that are quicker. The positive correlation between latencies and duration below 3 cm indicates that slower fish generally spend more time on the bottom of the tank. These correlations being the most prominent, PC1 clearly defines vertical speed. Much (23.8%) of the variation in boldness behavior was characterized by duration of aggression, swimming activity, and time spent eating. These results are unique because the correlations within PC2 are independent of the correlations within PC1. Swimming and aggression appear to be positively correlated, composing a single measure of activity. However, activity does not appear to be energetically favorable when seen correlated with all other variables; active fish eat for a shorter amount of time, are slower to begin eating, and slow to begin swimming. Interestingly, active fish also spend more time above 3 cm and have a shorter latency to emerge from start box. Summarizing these correlations, PC2 describes inefficient activity. Variables characterizing PC1 and PC2 contributed most to the overall correlation of boldness behaviors, as their arrows extend furthest from the center of the 2D loading plot. Because vertical speed and inefficient activity most explained all fishes' syndromes, temporal situations were plotted on PC1 and PC2 axes. Adults and juveniles displayed inverse behavioral syndromes that were significantly different from each other (ANCOVA; F ratio = 9.0904, p = 0.0251). 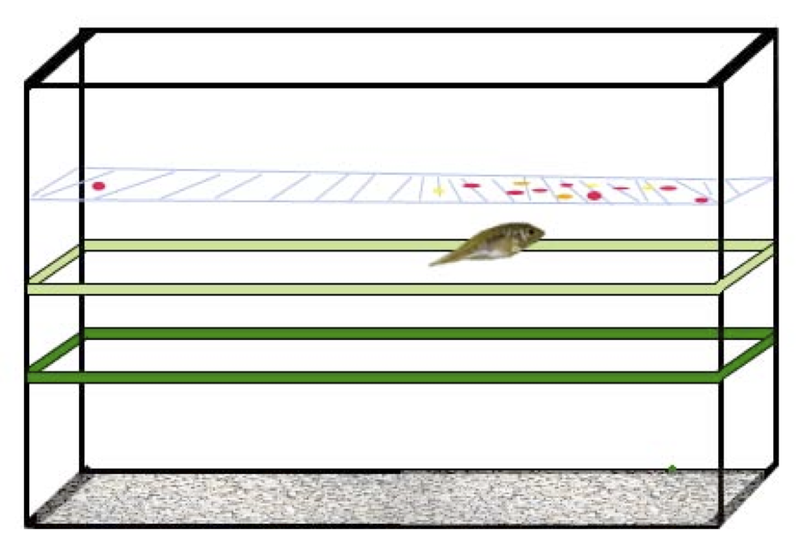 Juveniles utilized a strategy that increased vertical speed (PC1) by increasing inefficient activity (PC2).